The Healthy Juicer is a terrific wheatgrass juicer and economical. It is portable and durable featuring tough Polycarbonate (Lexan) parts and a stainless steel auger tip. The inner end cap is also stainless steel to powerfully crush and juice greens. 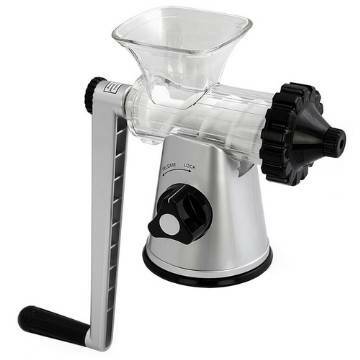 The Health Juicer can attach to any smooth kitchen counter or table surface using the patented suction base that is rated at over 100 lbs of force. Alternately you can use the corrosion-free metal clamp to attach it to a table or countertop. The 10” long handle provides excellent leverage to make turning the auger easier. All Materials comply with FDA standard and EEC 90/128 Migration test.